After leaving the town of Gaeta, on the mainland, we sailed 23 nm to the nearby island of Ventotone. Ventotone is one of the Pontine Islands in the Tyrrhenian Sea. According to Wikipedia, the island is the remains of an ancient volcano. It is only 3 kilometers long and 800 meters at its widest. Despite its small size, and rather dry and rocky terrain, it is a magnificent place, and a very popular destination for tourists, including many fishermen and yachties. The anchorage is very open, sitting along the east side of the island, without any real indentation to afford shelter to boats. We were not sure we would be able to stay long, as that kind of anchorage tends to get very rolly. Luckily for us we had five days with very light winds, and all coming primarily from the west. This made the anchorage smooth and comfortable. Ventotene is as far north as New York City. There is an ancient port at the base of the town that was carved out of the soft limestone by the Romans. It is very small with almost no turning room for any boats that venture in. It was absolutely jam-packed with fishing boats when we arrived. 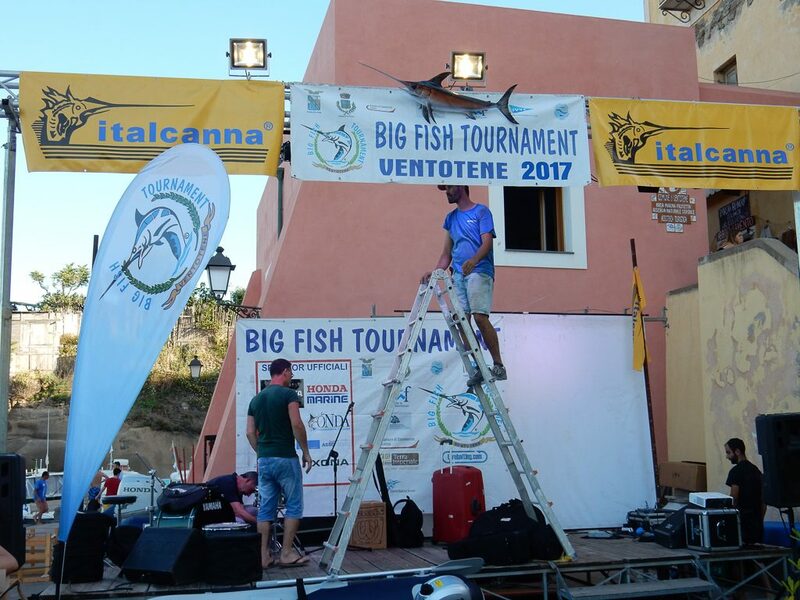 We had arrived just in time for their annual “Big Fish Competition”. For two or three days the fishermen competed, all leaving the harbor (and motoring right by our boat in the anchorage) in the morning and then racing in just before sunset. We counted at least 60 boats, but there could easily have been more. It was fun to see and we were sorry that we never got to see any of their catch, except one rather large Big Eye Tuna. The water was clear and warm and we had some lovely swims off the boat. The bottom had some sand, but was primarily huge slabs of rock that looked as if they had been carved by hand and then somehow dumped there. Perhaps the rock that the Roman’s excavated to construct the harbor? Besides the beautiful clear water for swimming there were places to walk, all with outstanding views of the sea and the nearby islands. 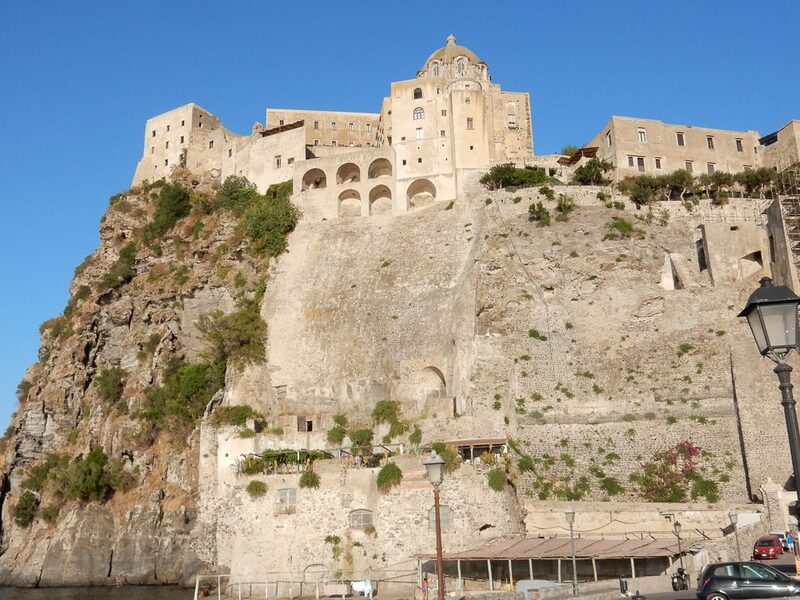 The island closest to Ventotene is San Stefano, famous for its prison camp that was created under the orders of Mussolini. The prison is no longer used, but still stands atop the island, looking very bleak and forbidding. 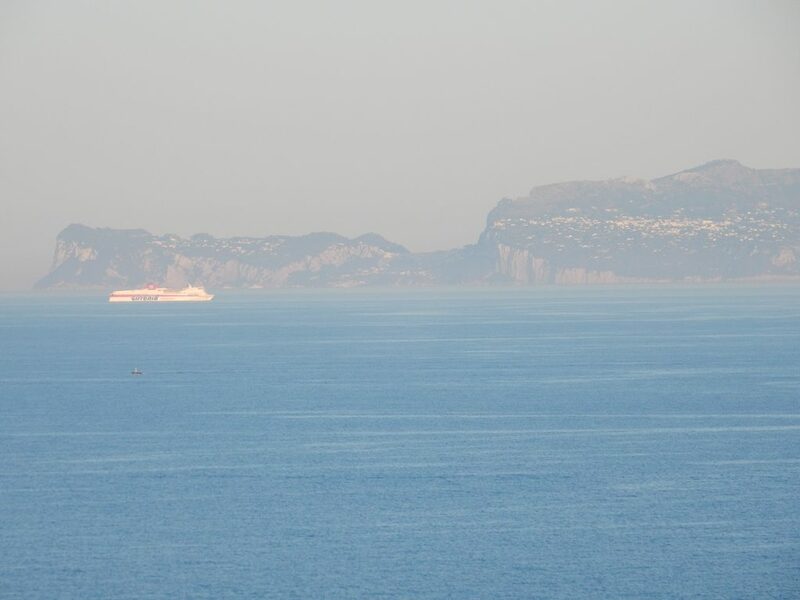 Beyond that (another 20 nm to the west) is the island of Ischia which was also visible. We ran into some sailing friends as we headed to town for dinner one night. Dan Culpepper is an American sailor whom we had just met the week before at our 4th of July party in Gaeta. 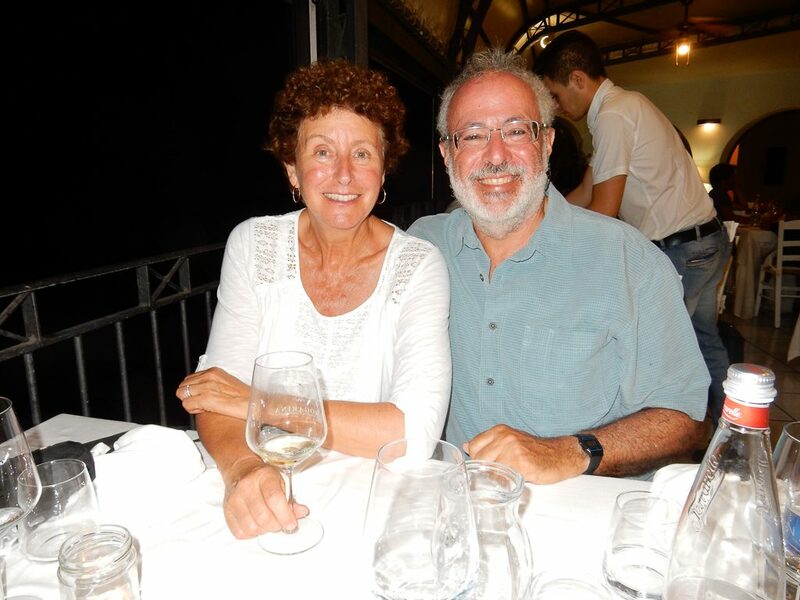 He was with his sister (Laurie) and the two of them were just stopping off in Ventotene on their way west. We had a lovely dinner with them at “La Terraza di Mimi”, a restaurant with beautiful views over the ocean and the nearby islands. It was a full moon that night (July 9th), and we had unbelievable views of the huge moon rising right over the horizon. 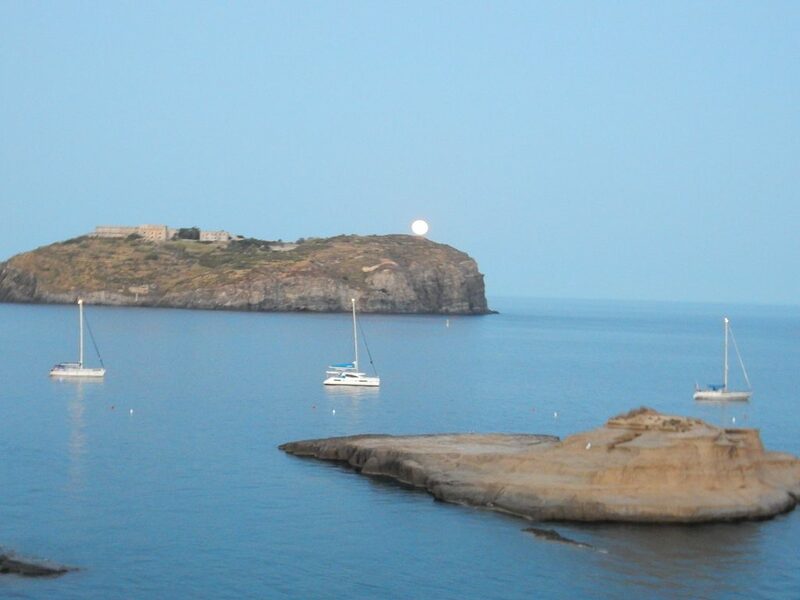 View of full moon rising across from our dinner table at “La Terraza di Mimi” (Ventotene). The Mussolini era prison for political prisoners is visible in the photo. The strange thing about Ventotene was that during the day the anchorage was really filled with boats… dozens and dozens of them, but by evening, nearly every boat picked up anchor and left. We never could figure out where they were going and why they would be leaving at that time of night. The motor-boats could probably return to the mainland easy enough, but for the sailboats it was a 4 or 5 hour sail. So why not just stay put for the night? 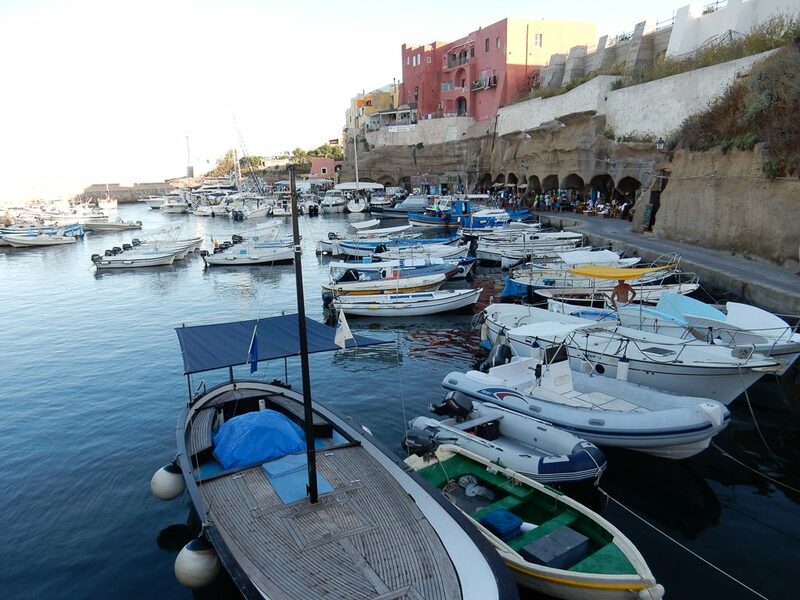 There was a marina at Ventotene in addition to the ancient port, but with rates of at least $100 a night, it is hard to understand why they would go there rather than stay in the comfortable free anchorage. After five days in Ventotene the winds started coming up from the north and the east which meant we had to leave to seek safe anchorage elsewhere. 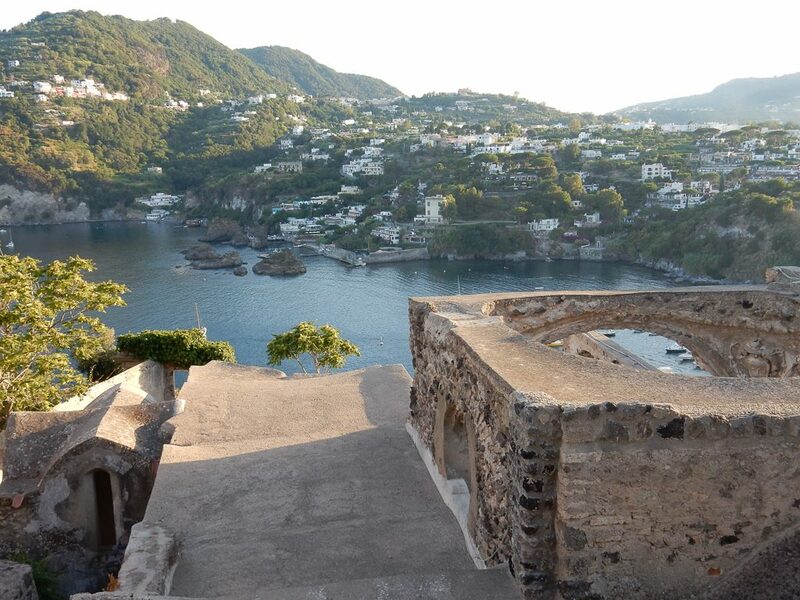 We sailed to Ischia, another volcanic island in the Tyrrhenian Sea. The eastern side of Ischia is only about 20 nm from Naples on the mainland, and 13 nm from the more famous island of Capri. 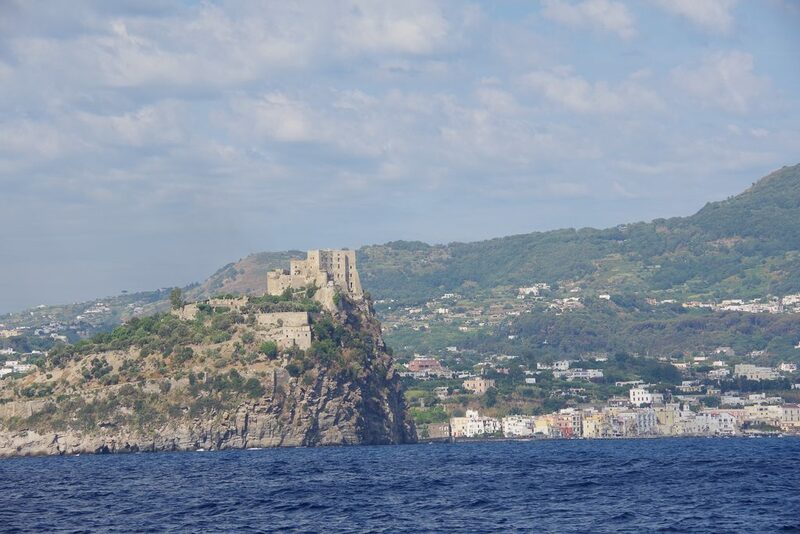 As we sailed across the northern edge of Ischia we were amazed to see how green and forested and mountainous it was. Most of the islands we have been to in the Med are beautiful, but very dry and definitely not green. 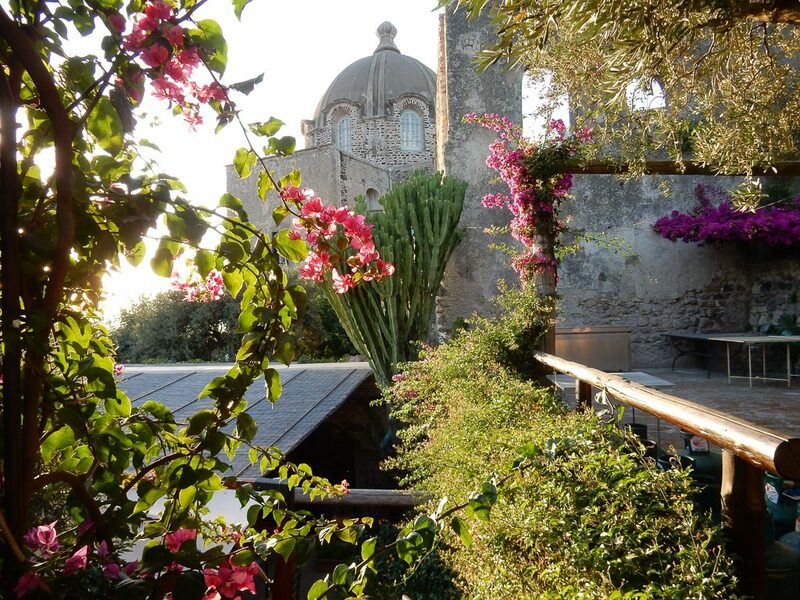 Ischia may not be as well-known as Capri, but some consider it to be more beautiful. I guess we will never know as Capri is an extraordinarily expensive island to bring your boat to and we decided not to go. There is little to no space for anchoring in Capri and so you are forced to go to a marina. Some friends of ours said that they were charged $350 a night and then in the middle of the night the marina cut off their electricity because they said they had not paid enough to keep it running all night! On Ischia, however, there is more than enough room to anchor for many boats with good protection from most wind directions. There is also a large marina in the main harbor which is very popular. 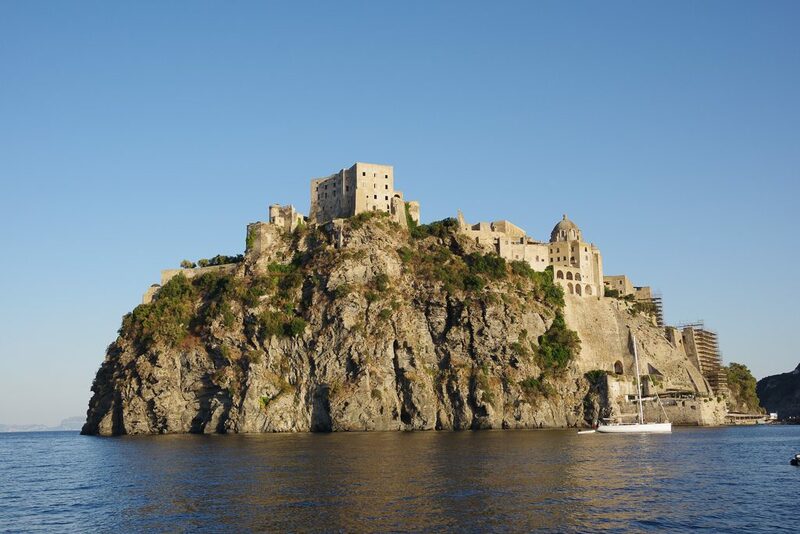 We chose to anchor behind the Aragonese castle, last rebuilt in the 1500’s, which is on a small steep, rocky island connected by a causeway to Ischia, and is the most highly visible landmark around. This little islet and causeway makes for two excellent areas for anchoring, one north and one south of the causeway. Since the winds change so often around here, this was a very useful feature and we ended up spending half our time anchored north of the castle, and half south, depending on wind direction. The views of the castle are very beautiful both by day and night. The water is also very clean and clear, although the bottom is very grassy on the northern side which makes for somewhat uncertain holding. You can also tour the castle and it was well worth the visit. 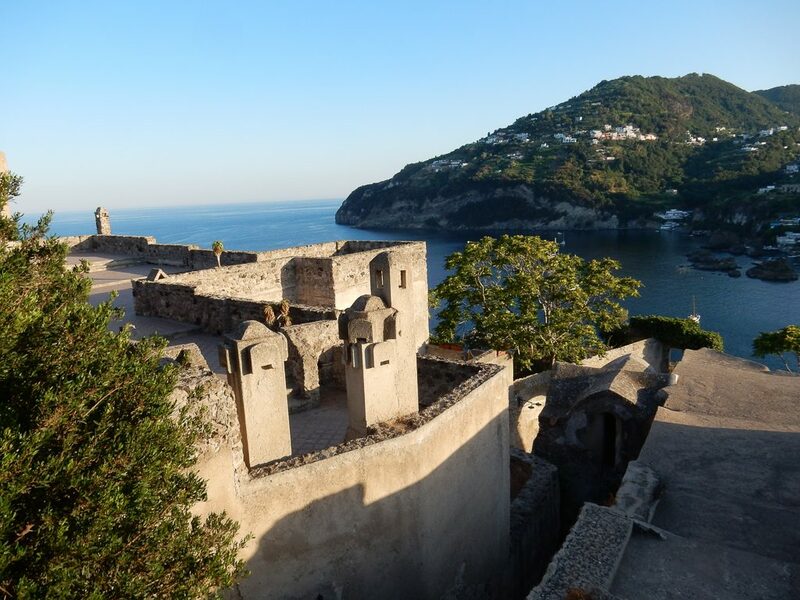 Besides the interesting architecture of the castle there are amazing views all around, extending to the mainland, Capri and even Pompeii. 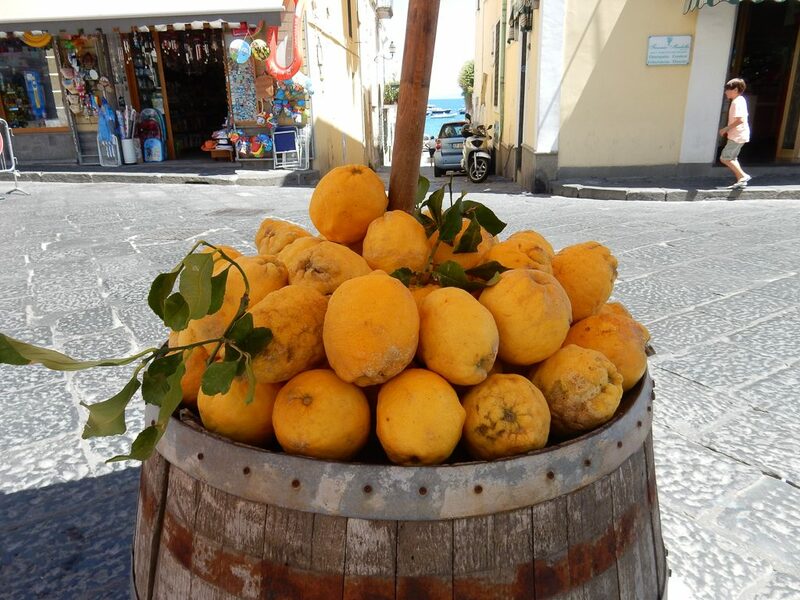 Ischia is a very popular tourist destination due to its proximity to the mainland and there are hundreds of shops lining the main roads, with several long blocks restricted to pedestrian access only. There is a constant stream of ferries to and from multiple locations on the island. 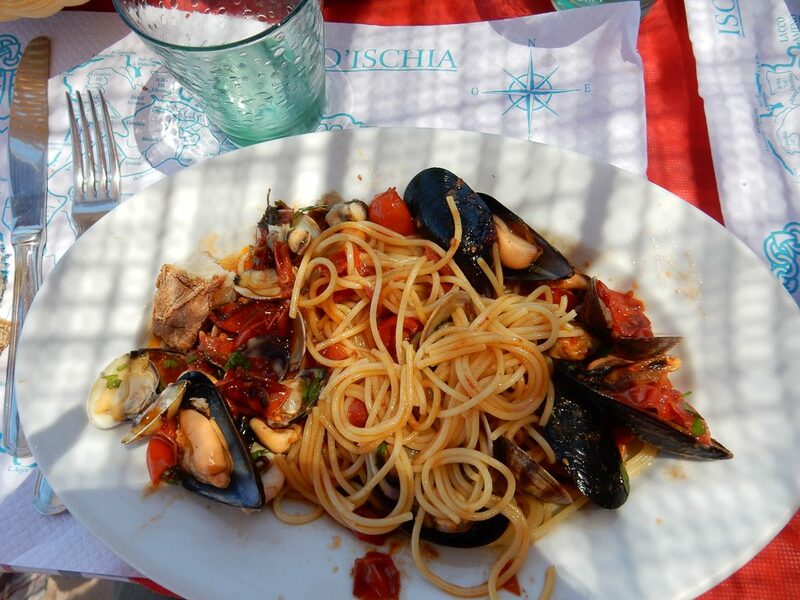 There is a very convenient bus service that takes you to the main port in Ischia town from which you can catch other buses that go all around the island. There were docks that we could tie our dinghy up to which made going into town very simple. 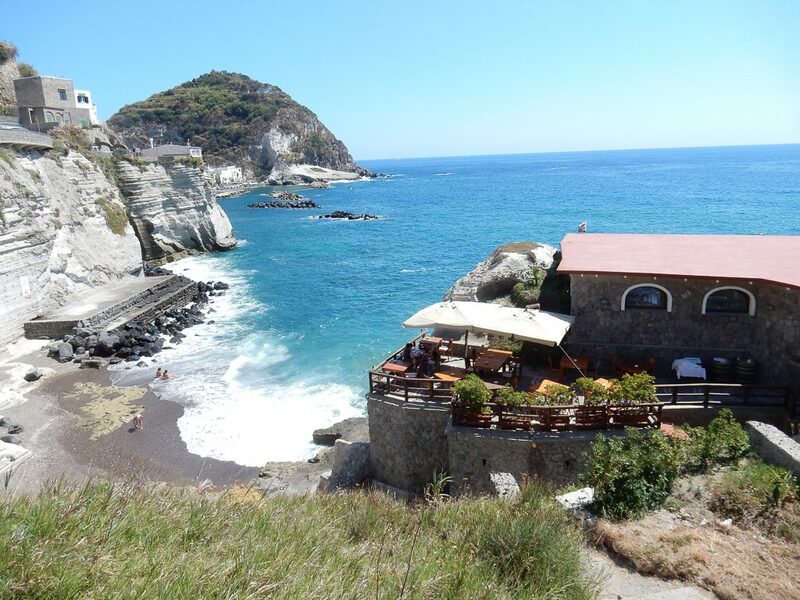 We found an amazing restaurant about halfway between the castle and the port area, called Ristorante Da Bellezza. It was just perfect, a family run place with grandma cooking in the kitchen while her daughter served and her grandsons sat on the terrace, fishing. 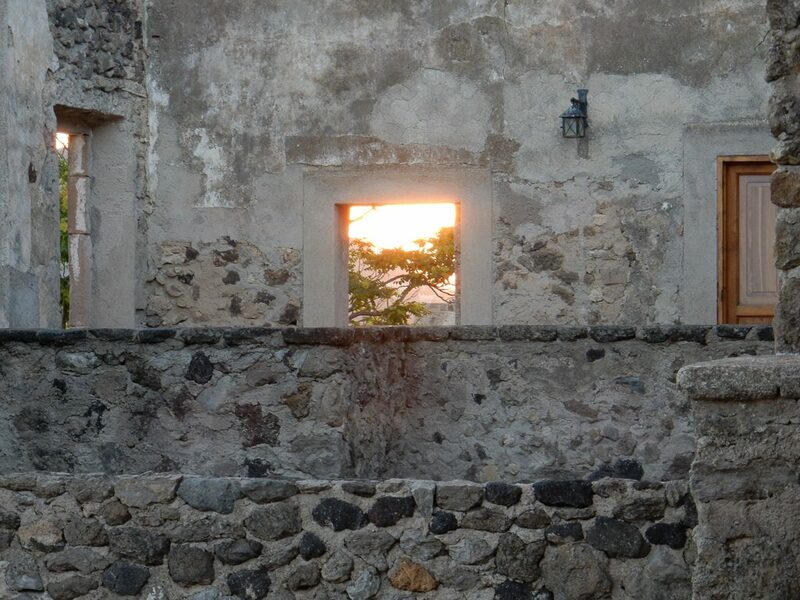 One day, as we sat on the terrace of the restaurant we looked across to Pompeii and saw thick smoke in the air. It looked as if the volcano was erupting. It turned out that forest fires were raging across the area, as well as up and down the whole coast of southern Italy. For a few days there was haze in the air and it looked as if the fires were causing a great deal of damage. They were certainly affecting the tourists who might have planned to go see Pompeii or visit Naples at that time. The forest fires also affected our plans to continue south to Calabria and then cross over to northern and western Sicily. Sometime ago we had even booked a marina for 6 days in Tropea in Calabria. 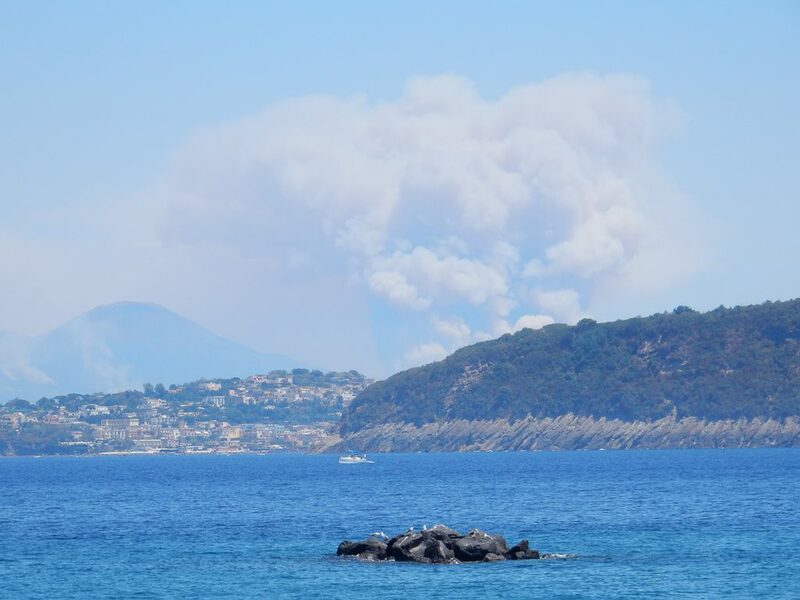 The risk of smoke from fires made it seem unwise to continue south along the Italian mainland. Friends sailing in Sicily reported dense smoke and evacuations. 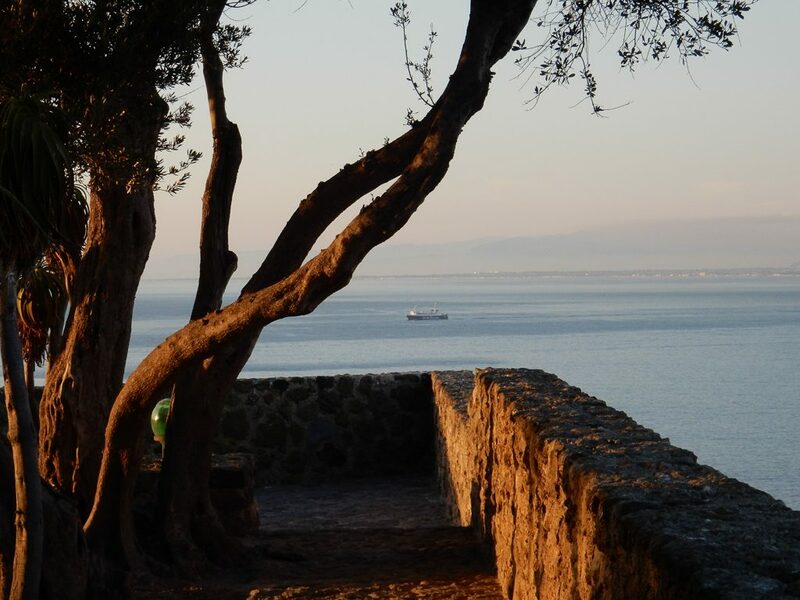 The marina was nice enough to cancel our reservation and we are now looking to cross the Tyrrhenian Sea and return to Sardinia, where there are no reports of forest fires. One day we took a local bus which brought us all around the island. We got off about halfway around and checked out the anchorage in the south (S. Angelo). We had thought of moving our boat down there if the winds turned easterly, but we did not like what we saw. It did not seem like a very well protected anchorage, except from northerly winds. The town itself was modern and architecturally uninteresting and just way too touristy for our tastes, but we did manage to have a good lunch at a place with stupendous views of the ocean. The bus ride back to town was hair-raising. The road up from S. Angelo zig-zags steeply up a mountain and then back down again. Our bus was a full sized city bus and the roads were two-way. When another bus came around a corner from the other direction there simply was no room for the two to pass. The two drivers would play chicken a bit, and then one would have to back up until a slight clearing could be found. To make matters worse there were lots of cars squeezed along the sides of the road, making it even more difficult to find a clearance. After one particularly difficult back-up maneuver everyone on our bus started applauding the driver. Sometimes a big tour bus would appear, which was even bigger than the city buses and then it was really something to make room for passing. It was such a crazy ride. I don’t know how the drivers can do it all summer long. After seeing the whole island we decided that the most beautiful part was right where we were anchored, under the castle. On our last Saturday the entire anchorage was jammed with boats. We had really not seen so many boats anywhere up until this point. I guess mid-July is the beginning of the absolute busiest month here. Strangely enough though, by evening at least half of the boats disappeared again. With winds forecast to come up strongly out of the northeast for the early morning hours of the 16th, we decided it was time to move again as neither the northern or southern anchorages we had been in would have been tenable. 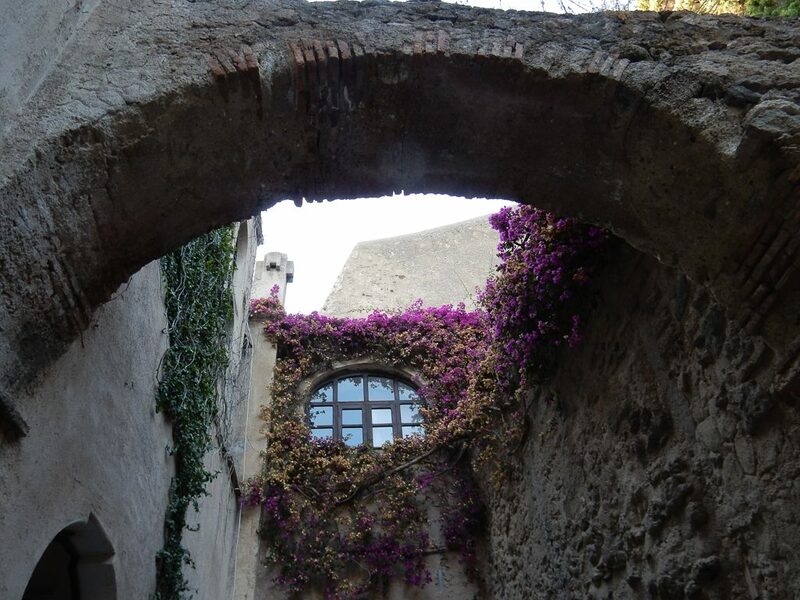 This time it was a very easy move… just 2 km away to the neighboring island of Procida. The anchorage was perfect for the conditions and we had a comfortable night there. When we pulled into the anchorage, just before dark, there were only 3 sailboats there. During the night we could hear the noise of marine diesels and anchor chains on windlass. Apparently, other sailors were not sufficiently attentive to the weather reports and got caught in the wrong anchorage when the wind shifted. When got up in the morning we were surrounded by 12 boats! That’s the first time we have seen such a dramatic change overnight.